I have met all the candidates for congress and while I think that all of them are “nice guys” I am going to have to throw my support behind someone who is talking about the issues that are important to my family and friends, Greg Hughes. I met Greg Hughes when he was running for Governor. He was motivated and traveled all around Iowa trying to convince people to vote outside of the two party paradigm. I was disappointed in the media for not talking about him simply because he wasn’t a democrat or republican. It was clear then and it’s clear now that things haven’t changed and there is no plan to mention him. What is Greg Hughes talking about that the other candidates aren’t? The destruction of the family unit! Why are grandparents being denied custody to their grandchildren? One grandmother was denied custody because she didn’t have enough income! So, the state will give strangers a check for a child that they put in foster care but won’t help a grandmother? What is wrong with our family court system? Why are children being put with strangers when there are family members who will take care of them? The court system is broken! Greg is the Chair of the Iowa Child Support Recovery Committee to the Supreme Court. He talks about people who have been jailed for delinquent child support payments. One man is a veteran who was jailed even after he paid his child support! What kind of judge jails one of our veterans during such hard financial times for late child support payments? A bad judge that’s who! Even though this man paid his child support, in full, he was still forced to do time! How are people supposed to work to pay child support when they are in jail? Jail is not the answer! Jailing people over things like this is a huge problem in Iowa. Greg is talking about disaster reform. In 2008, 78 of the 99 counties in Iowa were declared a “federal disaster”. “More than $153 million in federal assistance has been approved for individuals, businesses and communities in Iowa, according to state and federal recovery officials.” This money has been misused in so many ways it’s not funny! This needs to stop! To this day the City of Cedar Rapids is using FEMA money just because it’s there! While homes that were rebuilt were demolished for a check the city complains that there isn’t enough affordable housing! UNREAL! People impacted by disasters shouldn’t have ever been forced to sell their homes in a “voluntary property acquisition”! Greg Hughes is genuinely concerned for the people of Iowa and we finally have a chance to elect someone who isn’t afraid to deal with entities such as the “Child Support Recovery Unit” and “DHS” or the “Department of Human Services”. We need reform and there is no way that these LAWYERS running for office are going to give us any hope for that! I have spent a lot of time vetting all the candidates. I’ve given the other candidates the opportunity to “win me over” but neither one of them will touch anything that I feel is important to Iowans! It’s important to know who is on the ticket this election and to vote wisely. A vote for the democrat or republican is a vote for the status quo. 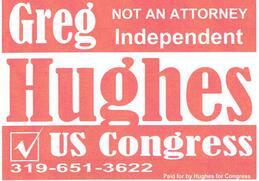 A vote for Greg Hughes is the only way to go! I hope that everyone gets out and votes for him so that we can get to work on this! The only way we’re going to be able to take our power back is if we take it away from the attorney’s that have spent years profiting off of us and our misfortunes! This entry was posted on Wednesday, September 19th, 2012 at 4:41 pm	and tagged with Ben Lange, Bruce Braley, Congress, District 1, election, Greg Hughes, iowa, Iowa Politics, US Congress and posted in activism, Advocates, Cedar Rapids, Iowa, CRSMELLS, Iowa Politics, Voluntarism, world news. You can follow any responses to this entry through the RSS 2.0 feed.